The guys over at The Kartel have put together a list of their top 10 games from the 90’s that have aged quite well. Most of the games are from the Super Nintendo era and we even got one Zelda title on the list; A Link to the Past. This is what they had to say about the Zelda classic. This game perfected the dungeon-adventure-RPG formula. Taking lessons learned from its previous iterations and adding in new features and abilities to keep things fresh. This entry into the series saw the birth of many features now commonplace in the franchise. 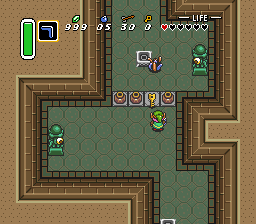 The introduction of a “Dark World”, Link could travel to at any point added new depth to puzzle solving along with the design of multi-level dungeons. New items like the Master Sword, Heart Pieces, the Hook Shot, Pegasus Boots, and the ever popular Spin Attack technique all came from this game. The staples of the franchise today can find their roots in a Link to the Past, which not only created them, but implemented them in unique ways that are still copied and used in the latest Zelda games. Check out the full listing over at The Kartel.